And when we’re knee deep in some sort of change or stressed to the max, it’s hard to remember to eat or take daily medications and/or vitamins, let alone make sure we are journaling, breathing, meditating or taking a daily walk. Sometimes self care must be put on the back burner during these times when other priorities or concerns have intensified. But don’t give it up all together. Right now, what do I absolutely need the most to stay centered and grounded in my own self care? Who can I turn to for help and support? What can I control at this moment? This helps you stay present and feel less anxious. Easier self care activities like deep breathing, stretching and walking are a small activity that you can control and practice quickly. What can I plan to do for myself when this situation/crisis/illness is over? Where am I holding tension? How can I release it? Draft a quick emergency self care plan – think about what you need the most and can do easily. Asking for help is a simple act of self care. Find a caregiver or someone who can help with work, child/parent care, etc. just for a little while. If you’re sleeping through medication times, set a timer in your phone or other device to remind you. Listen to music or watch funny movies or sitcoms. Read peaceful or favorite books. 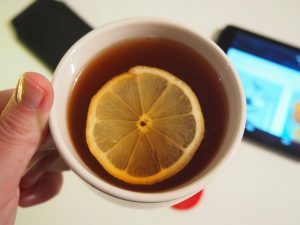 Make a cup of tea as often as you need one. Remember – self care is an act of love and kindness and is especially during times when you are sick or in some type of chaotic change. Even good change can throw your routine into a place that doesn’t feel like it has room for self care. Make room for whatever you can, when you can. Self care will ebb and flow – just don’t let it recede completely.